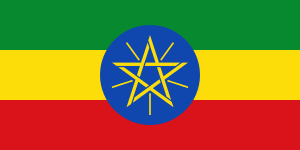 Ethiopian Semitic (also known as Ethiosemitic or Ethiopic, or in the past as Abyssinian) is a language group, which forms the Western branch of the South Semitic languages. The Ethiopian Semitic languages are spoken in both Eritrea and Ethiopia, and one of these idioms, the Tigre language, is spoken in both Eritrea and Sudan. Some linguists have begun calling this group "Afro-Semitic" to avoid the exclusive focus on Ethiopia. However, this usage is not widespread. The division into Northern and Southern branches was established by Cohen (1931) and Hetzron (1972) and garnered broad acceptance, but this classification has recently been challenged by Voigt. While focused on Semitic languages as the only branch of the broader Afroasiatic languages that is also today distributed outside Africa, a recent study by Kitchen et al. 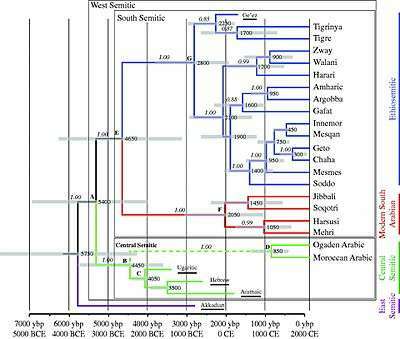 proposed through the use of Bayesian computational phylogenetic techniques that "contemporary Ethiosemitic languages of Africa reflect a single introduction of early Ethiosemitic from southern Arabia approximately 2800 years ago", and that this single introduction of Ethiosemitic underwent "Rapid Diversification" within Eritrea and Ethiopia. The Ethiopian Semitic languages all share subject–object–verb (SOV) word order as part of the Ethiopian Language Area. Ge'ez (Ethiopic, and in the farther past Abbysinian) – extinct; liturgical use in the Ethiopian Orthodox Tewahedo Church, Eritrean Orthodox Tewahedo Church, Ethiopian Catholic Church, Eritrean Catholic Church and by the Beta Israel. ↑ Hammarström, Harald; Forkel, Robert; Haspelmath, Martin; Bank, Sebastian, eds. (2016). "Ethiosemitic". Glottolog 2.7. Jena: Max Planck Institute for the Science of Human History. ↑ Bayesian phylogenetic analysis of Semitic languages identifies an Early Bronze Age origin of Semitic in the Near East.